Adobe Creative Suite 5 Is (Almost) Here! My, how time flies! Seems like only yesterday I did a presentation on some of the "new" features of Adobe's Creative Suite 4. Well, Adobe is not one to rest on their laurels. It is time for the release of their latest and greatest version of the Creative Suite product line! 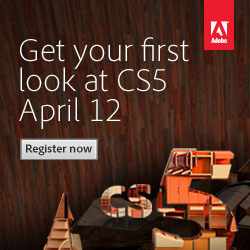 For more info and to register, go to the CS5 Launch Site.